I do a reader survey once each year, usually right before the HIMSS conference. I then review the results along with other feedback I receive to plan the upcoming year. I always make at least a few changes that readers suggest. Thanks to everyone who completed the survey, including the person who won the random drawing for a $50 Amazon gift card. I have a diverse and opinionated readership. Some people are interested in only a subset of industry topics. Others want a basic bullet list of headlines and nothing more. Still other readers either like or don’t like rumors, humor, or certain parts of HIStalk like CIO Unplugged or Readers Write. While I truly appreciate and will consider all suggestions, I don’t want to fall into the trap of “designing by committee,” where the quest to displease no one ends up in pleasing no one, either. So, don’t think I’m not listening just because I didn’t immediately act. I’ve been able to stick to writing HIStalk for 14 years now only because I do it in a way that makes me happy and satisfied. I’m lucky to have found a self-selected audience that keeps coming back. I’m therefore in agreement with the most common “what should I change” suggestion, which is to not change anything significantly unless it’s a clear improvement that’s within my grasp. I have zero interest in getting bigger or slicker if it’s not fun. I’ve also learned a big lesson over the years – everybody likes to read, but few like to write. Suggestions often involve getting new non-vendor contributors or participants, which would be fantastic, but that has failed every time I’ve tried. Writing is hard for most people and their jobs often limit their availability, so even the most eager writers often fade away after writing a handful of times. Read on below for the kinds of contributors I can use and would be willing to pay for (another lesson learned – consistent contribution requires some level of payment). That last stat is what keeps me coming back every day. Readers, too, probably. I asked which HIStalk features the respondent appreciates most. I should note that I haven’t run an Advisory Panel for a long time since I was getting fewer and fewer responses, so many respondents probably don’t recall what it is. Here are the most frequently suggested changes, along with my responses. I’ve added somewhat effective “search by date” capability in the sidebar. It’s not perfect, but it works well enough that even I used it when trying to find something I’ve written in a given date range. Move the Readers Write bios to the top of the article and include that in the email notification. Good idea. I will do that. I initially had a reason for putting the bio last, but I’ve forgotten what it was. Create articles around questions that readers can answer anonymously. I like that idea a lot and I’ll start that this weekend. It will fizzle out quickly if I don’t get responses, but it’s worth a shot. I’m a hospital guy, so while I cover the topic when something interests me, it’s not a big emphasis. I would be happy to add a weekly digital health summary if someone wants to write it or help me figure out the kinds of topics it should include. My non-domestic audience is about 5 percent, with the top five non-US countries being Canada, India, the UK, Netherlands, and Australia. I would be willing to add a weekly summary of non-US healthcare IT news if I can hire someone knowledgeable to write it in adding more value than I could. 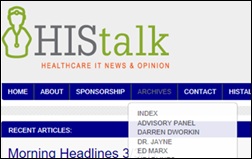 Add the ability to see all of a particular type of article, like Dr. Jayne or CIO Unplugged. That’s available now. Hover over the Archives link at the top of the page, then click Dr. Jayne or Ed Marx to see all of their posts. You can also hover over Articles and then choose Index to see a newest-to-oldest list (rather than the full articles) by category, then click on any article to jump to it. Add Dr. Jayne-like commentary from nursing, lab, pharmacy, etc. even if only quarterly. I’ve appealed for such writers before with no takers, but I’ll throw it out there again and offer compensation for someone who is skilled and reliable. I always ask the person for examples of similar writing they’ve done or for them to write a sample article. That’s usually where the previously enthusiastic conversation ends. As I mentioned before, I can run the articles anonymously since I know first-hand from nearly being fired for writing HIStalk that employers aren’t always supportive. Create an iPhone app since I like to do my reading in the morning. Bringing up the site on a mobile device should display the site in an easily navigated mobile format. If not, scroll down and you’ll see the “desktop/mobile” chooser. I’ve looked at full-fledged mobile apps, but they don’t seem to offer a lot more than the mobile-optimized theme I already have. Do more with social media. My personal experience is that social media is overrated for a site like mine. I’ve looked at the stats and there’s no uptick in actual site readership from a blitzkrieg of tweets, Facebook posts, and LinkedIn items. I’ll think about revisiting, but social media campaigns work best for consumer sites rather than business-related ones. I’m happy to take advice from experts who believe otherwise. This came up a bunch of times. I have no plans to quit. Writing HIStalk is a hobby rather than a job to me, so I have no motivation to stop doing it any more than someone else would to quit playing golf, going to movies, or having dinner parties. I know a lot of fellow readers of the site who are in their 20s (thanks to Epic staff for encouraging employees to read the site regularly) who would love to see some representation outside of predominantly older, white male execs. That’s a totally valid and relevant piece of the industry, but there are also a lot of badass young leaders, providers, and technologists (not just start-up founders shilling product) who I’d love to see on this platform, too. That would be great if I could fine someone, even if they have to contribute anonymously for work reasons. Offer an honorarium to ongoing contributors. I’m perfectly willing to do that. Get rid of the smoking doctor’s pipe. I’ve made so much fun of newbies who think they possess rare insight in noticing that the logo of a healthcare IT site is a smoking doctor that I have to assume this was (like the logo) intentionally ironic. If not, I’ll counterbalance it with another reader’s suggestion – give the doctor an additional accessory of a martini. Add a thumbs up/down capability to articles and comments. I admit I cheated a bit in reading this comment several weeks ago and then buying the thumbs up/down plug-in that’s on the site now. It has been used nearly 3,000 times since I installed it over the holidays, including by me. I admit I’ve considered this several times. I turn down a lot of articles that are boring, unoriginal, vendor-slanted, or not all that related to health IT, but most of what remains still has some of those characteristics because vendors pay their PR people crank out dull, inexpert prose in which a vendor pitch is not too cleverly concealed. I keep thinking that providers will step up to the minor challenge of stating their opinion (even anonymously), but that rarely happens. Convert webinars into podcasts so I can listen to them on my commute. I think that’s probably doable. I also wondered whether people would appreciate having the transcribed webinar narration available to read as a PDF so they could distribute it, mark it up, etc. But let’s hear what you think – complete my little poll of which (if either) of those options you would use. A Facebook-like look back of the news of that day five years back. Great idea. I’ll add that to my calendar to add to each Monday Morning Update. Use hashtags or tags of some sort so people can follow specific topics that interest them and get a weekly digest of headlines or posts relating to this topic. Several people suggested that HIStalk posts could be repackaged into a curated summary of some type. I would have to understand the topics, but certainly one would be all items for specific vendors, which might then create a separate post (maybe on a separate site just to keep the clutter down) or as a weekly email with its own subscriber list. Tell me what you need. Please stay focused on what you do. Additional news or too many communications can become overwhelming. I agree, which is why I write one consolidated news article three times per week instead of blasting out every story individually. Anything I add would most likely have its own email subscriber list. I love the idea of an email bulletin, beyond the headlines. I agree. Email newsletters are hot again, especially if they are pithy and sassy. About three-fourths of a small number of respondents to a recent poll I ran said they would read a daily email, although I didn’t ask about a weekly one. Facts are appreciated more than opinion. Not to everyone. I know it seems obvious when you’re reading a site to think that every reader perceives it the same way, but I can say with certainty that it’s not that simple. 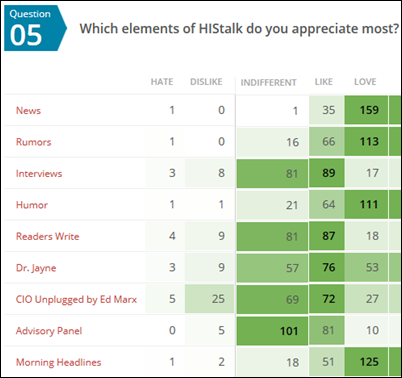 More people say they read HIStalk for opinion, rumors, humor, and even music recommendations than say they wish I would stick to the same facts (usually from press releases) that every other site runs. I try not to be heavy-handed or to pedantically pontificate, but I also don’t hesitate to interject my opinion and welcome readers to agree or disagree in the comments. Improve the home page layout. Having three columns is distracting and makes the page feel pinched when you get further down. And I never use the sponsor quick links – they just take up a lot of space on the screen, making it look busy. I’m considering making some changes to skinny down the items in the right columns. Most are important, but they don’t necessarily need to display with each page view – a flyover menu of some sort would make them readily available without taking up space. Stay tuned. Add one random and/or humor related item to the summary email you send for posts. I try to do that, although I admit that I’m usually physically and emotionally drained by the time I send the email because I’ve been heads-down in deep thought for hours. Get a DC insider to write. I assume that means DoD and VA, although maybe I’m interpreting too narrowly and you’re actually interested in more political topics (in which case I’ll pass). As a reader, what would you like to see? You could seriously sell your content curation and insights, especially if they were well-indexed for research purposes. I would buy a personal subscription. I’m not interested in selling anything, but tell me what you would find useful. I invited respondents to say anything they want. How long until you quit? I want to make sure I’m done before then; I can’t imagine doing my job without you providing the necessary information I need for my job. It’s still my favorite work-related read of the day. I love HIStalk. It’s my favorite guilty pleasure. I like the balance of news and fun. Also appreciate your candor when people send you unsubstantiated information. Love it — and you’re great, but I’ve got to say that I get downright excited to read Dr. Jayne. This is a wonderful service to the community. I think you do a phenomenal job of bringing the news and sharing your personal insight as a long-time industry observer. I’ve been reading HIStalk since I started working in the industry 12 years ago. I think the site could be even better if it stopped running unsubstantiated rumors as if HIStalk was the National Enquirer or Fox News. Love it — specifically feel indebted to you for your summation of various complicated government rulings and policies. Also greatly admire what you have done with your reach when it comes to DonorsChoose. Dr. Jayne is my favorite. I also love how Mr. H is not cow-towed by disgruntled readers. Got the balance right! I continue to find HIStalk a very valued resource. You also made a recent comment about death and who cares once you are dead. I hope you are thinking about who would take over HIStalk when you lose the interest in keeping up with it. I do not think this is a prepare to die exercise — rather a realization that HIStalk is a valuable resource and honest broker of information in the HIT world and very worthy of continuing. Based on your humor, your often highlighted other interests, I assume that someday you will want to spend your time on other things beyond the care you put into HIStalk. Conduct regional social events where readers can get together, or do it at Health 2.0 meeting. I was once a complainer about the pro-Epic vibes and I have to say that I don’t feel the vibe anymore so if you were trying (or maybe I was over-analyzing and grew another year older?). Thanks! It’s an amazing site and any criticism I have is honestly quibbling — I would hate it if you hung it up. I work with the DoD and VA on their interoperability and have noticed that your periodic comments about that subject are quite dated. The two departments over the past 2-3 years are far more cooperative, interactive and mutually supporting in interoperability/data sharing needs than ever before. Appreciate all of your hard work. Yours is the first news site I look at every day since I get both news and humor. It is an invaluable part of any HIS professional’s tool box. Thank you for this invaluable service. I truly appreciate that you offer thoughtful commentary, and not the generic re-spewing of outdated not-news that so many other healthcare IT sites espouse. 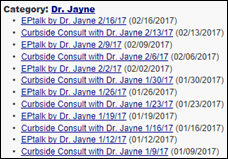 My favorite articles are often Dr. Jayne’s blogs. I love hearing about actual in-the-trenches experiences. Of course, Weird News Andy is good for a chuckle or a smh. And I appreciate the donation updates. 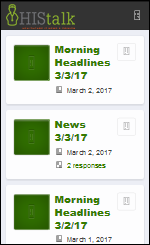 I check you daily and often share articles with others in my group. I’ve attended a few webinars and found them generally useful. On a regular basis I read something I find immediately useful for what I do, or something that spurs me to look deeper into some topic. In short, you’re great! I have been reading since the beginning and I’m a big promoter. I have mandated that my executives subscribe to the blog everywhere I’ve worked. So many people don’t bother to look outside their own little empires to understand the broader industry. You force readers to do that, and I am really grateful. So appreciate this resource. Single best blog I read and have read for 10 years now. I’m just a lowly independent Epic consultant (10+ years) but you really have helped me do my job better. I can chit-chat with a CIO waiting in line for lunch; and when I mention something I just read in HIStalk, he/she perks up and takes notice of me and we can carry on with a well-informed conversation. I have noticed that folks can tell if one has read HIStalk. I mention your site at least three times on every gig, so word-of-mouth DOES work. I can steer clear of (or be attracted to) Epic implementations that are in trouble, depending on the mood of my checkbook and my BS tolerance at any given time. I love Dr. Jayne’s commentaries and will go back to find one if I’ve missed a week. Her perspectives from "the trenches" are very beneficial from a physician’s perspective and I enjoy her writing style very much. Your donor matching program for kids makes my heart sing — that’s all I can say, except you are contributing to a generation of life-long learners. Ed is Ed, and I like him. Weird News Andy is a hoot — wish he’d do more, but he’s probably busy doing real work most of the time. And you, Mr. H, should be commended for maintaining a non-biased and well-written site for all of us to benefit from. You are a voice of reason (or at least, devoid of BS) in this whirlwind of healthcare drama. Your dry wit doesn’t hurt, either — I get at least one chuckle a day guaranteed, if not a belly laugh. Please keep doing what you’re doing. Peace Out and Happy 2017!! Thank you for all that you do, Mr. H., and I hope you benefit from HIStalk as much as your readers do. I feel that the site is at its best when it provokes disagreement between readers, as this is a good indication of a particularly sticky problem yet to be solved.